MINDING THE GAP: WHAT DO WE MEAN BY “DEVELOPMENT LEVEL”? Economics is a discipline that offers amazing tools for understanding the impact of acceleration in the modern world. The Gapminder Card Sort in Lesson 10.1 is a great conversation starter about many of these impacts, including economic development, modernization, and inequality. This makes the activity an excellent way to introduce issues critical to exploring where the human race might be headed. 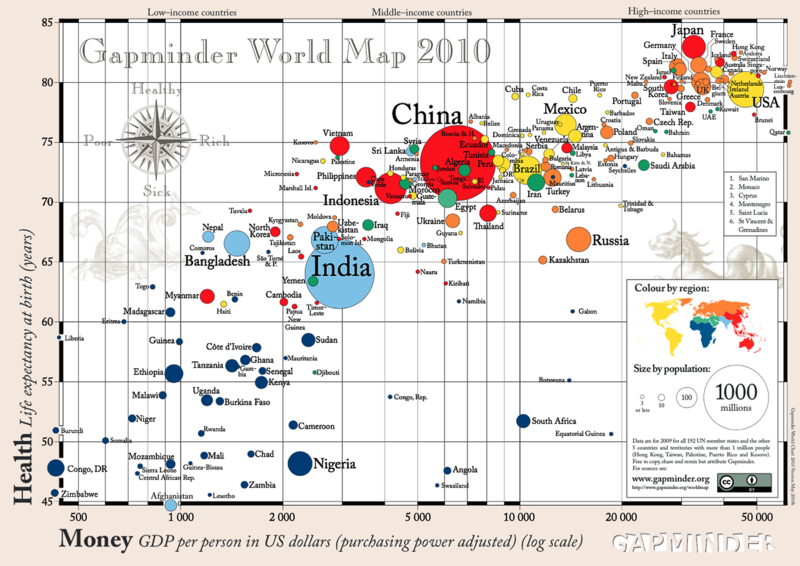 Gapminder World Map graph. Source: www.gapminder.org. CC BY 4.0. Students are broken into groups, given 16 country cards, and asked to rank the countries in order of development. Students are deliberately not told what “developed” means; they need to wrestle with the idea in their groups. They then need to do the ranking based on what they already know—or think they know—about the countries! Next, each group shares its rankings with the class and explains the criteria it used. As you can imagine, this leads to some very interesting discussion and debate, as the criteria chosen are not always predictable. Once that discussion is complete, each group is then given a graph that ranks the world’s countries based on life expectancy and income level. Each group can then use the graph to locate and circle the 16 countries and check the accuracy of their rankings. Studying the graph can be revelatory: “There are countries where people make more money than Americans? Where is Lichtenstein?” “The Japanese live longer than Americans, but make a little less. That sounds good to me.” The graph’s colors and bubbles provide a visual way of comparing a country’s population size, continent, income, and life expectancy, and this always leads the discussion in a myriad of new directions. The activity is based on the work of Hans Rosling. Students can visit his gapminder.org website and explore his data library and watch a short video—200 Countries, 200 Years, 4 Minutes—to explore further the creative presentation of statistics. About the author: Dave Burzillo has taught for over 30 years, more than 25 of them at his current school, a private high school in Weston, MA. For the last 7 years, he has taught BHP to ninth-, eleventh-, and twelfth-graders. His school runs on a trimester system, which gives him about 90 days to cover 13.8 billion years of history in each class. He has 12-16 students in each class. Recently, Dave began offering an online BHP course in the summer.